Let’s face it, we love our makeup but we don’t necessarily love the work of putting it on. We may like to look “natural” and there are times when we wear none of it, but if we are headed to work or out to dinner, out comes the makeup kit. “After 20 years working as a makeup artist I can say quite confidently that women wear makeup for themselves,” says Lisa Eldridge, the author of Face Paint: The Story of Makeup. “There are many different roles makeup can play in a woman’s life. There’s the playful and creative aspect – who doesn’t enjoy swirling a brush in a palette of colour? Then there’s the confidence-building aspect – why not cover a huge red blemish on your nose, if you can? Finally, there is an element of war paint and tribalism. Makeup can make you feel more powerful and ready to face any situation.” Unfortunately, all that application takes time, not to mention skill. Also, our active lifestyles come into play. Makeup doesn’t hold up well during a strenuous gym workout, in the pool or at the beach. 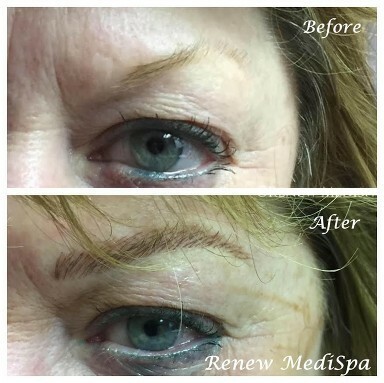 Renew MediSpa is proud to offer permanent makeup and microblading, an ingenious way for women to preserve their favorite makeup looks with less effort. With permanent makeup and microblading, you can continue to look polished through any activity, like exercise or swimming. With permanent makeup, you won’t have to worry about running out of your favorite shade, and you can say goodbye to hasty, last-minute messy eyeliner applications, not to mention those “racoon eyes” that result when regular makeup smears. 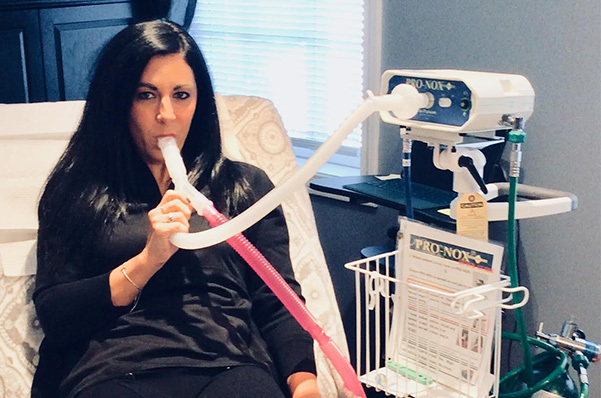 Renew Medispa is excited to offer Pro-Nox, a nitrous oxide gas which you can use during your procedure, for reducing pain and inducing a pleasurable feeling. Fast acting, safe, and short duration- It is the ideal clinical pain reliever and anti-anxiety measure, which can further enhance your comfort during procedures. Neat, well-defined eyebrows can truly frame the face and complete your look, but having overly sparse or patchy eyebrows can make you look sickly or exhausted. With microblading, our patients can have naturally fuller, more defined eyebrows that look virtually indistinguishable from the real ones. Microblading is a specialized kind of cosmetic procedure that uses a handheld device which creates micro incisions in the brows and embeds pigment into the skin in a way that resembles individual strands of hair; this results in a more natural, subtle definition of the brow. Add beauty for people who have undergone chemotherapy or another hair loss issue. We perform permanent makeup and microblading right here in our medical spa offices. 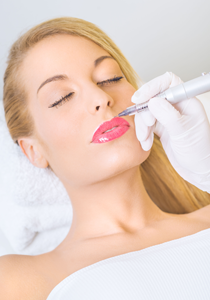 Before your permanent makeup procedure, we’ll numb the treatment areas with an anesthetic. Then, an automatic device will deliver pigment much like a tattoo artist does. Before your microblading procedure, we’ll give you a topical anesthetic and then plan the shape of your brows. We’ll use the natural arch of the brows and the face’s natural contours to make sure your microblading results look as natural as possible. Then, we’ll use the microblading device to carefully draw fine, individual strands of hair on the eyebrows. At Renew MediSpa, each patient is offered additional touch up procedure a month after their initial treatment to fine tune results. There will be some fading of the pigments over time, so it’s recommended that patients return for touch ups as needed in the future to reverse any fading. Week 1: Avoid heavy exercise. Keep brows as dry as possible (no swimming, soaking). Keep brows protected from sun exposure. The pigment will seem dark to you- do not scrub it as it is going to naturally lighten over the course of a week. You may have a mild itchiness during the healing phase- use ointment, do not scratch. During the healing process, try to keep sweat, soap, shampoos, cosmetics, lotions and dirty hands away from the brows. If there is flaking or tiny scabbing, do not pick at it. Keep ointment on the area as directed. 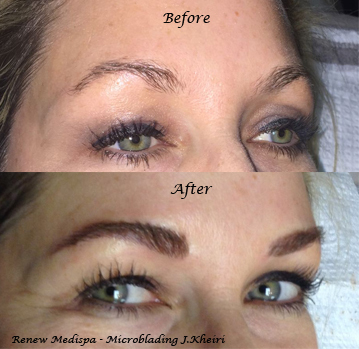 Why Choose Renew MediSpa for my Microblading and Permanent Makeup? Renew MediSpa will meticulously plan your procedure so that your results look as natural as possible and last as long as possible. We’ll look at the structures of your face and your skin tone to find the perfect shape and colors for our microblading and permanent makeup. We also make sure to use sterilized pigment that’s designed to mimic hair or makeup colors. We’ll make sure every microblading stroke looks natural and innate. Our philosophy is to err on the side of subtlety so that even friends and family won’t be able to guess what’s different with the patient. 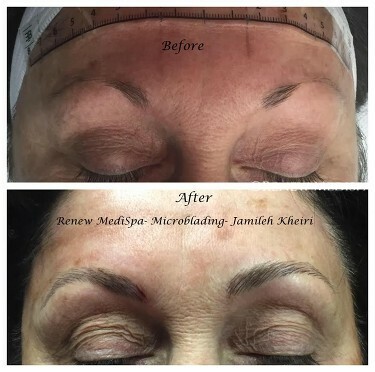 Renew MediSpa is proud to offer the services of esteemed Permanent Makeup Artist and Medical Esthetician, Jamileh Kheiri. 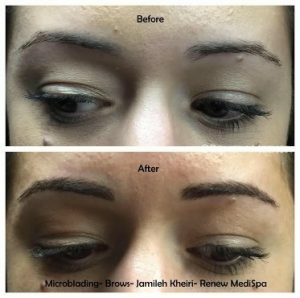 What’s the Difference Between Microblading and Permanent Makeup? Permanent makeup uses an automatic device to tattoo pigment into the skin, while microblading uses a manual, handheld device to implant pigment into strokes resembling fine hairs. 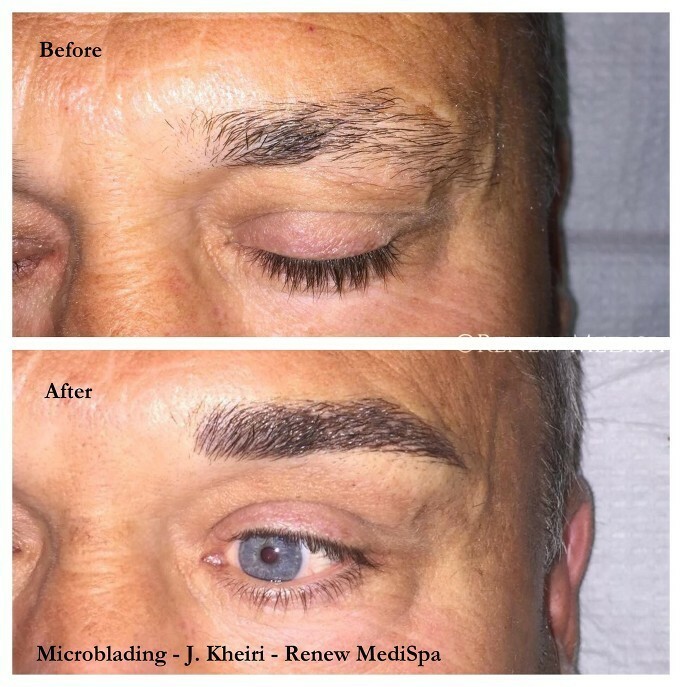 Microblading places the pigment slightly more superficially as the blade does not go as deep as the automatic needling device used traditionally. Microblading, therefore, needs to be touched up more often (even every 6 months). Our artist also performs a technique called Hairstrokes- this involves using the traditional automatic needling device but with a single needle attachment which can create strokes of pigment that have the appearance of individual hairs. Sometimes, she will even combine techniques. All of this can be discussed at the time of your consultation. Which procedure is recommended will depend on several factors including the color of your brow hair, the amount of hair you have naturally, your preferences and the desired duration of effect. A better term to use would be “Semi Permanent”. Microblading and permanent makeup both implant pigment into the skin’s dermis, but some of the particles that don’t make it to the dermis will disappear when the skin is healing or in the future as the upper layers of skin exfoliate naturally. Therefore, it is expected that there will be some fading over time. Some clients will add pigment in 6 months, others not for 18 months. It does depend in part on which technique you select, with the Microblading technique requiring touch ups sooner than the Hairstrokes technique. What Will Happen to my Eyebrow Hair? Hair growth will not be affected by either microblading or permanent makeup. How Bold Can My Makeup Look Be? We strive on creating a natural, subtle look with our permanent makeup and microblading, so patients should not expect a more dramatic look akin to what you would wear on a night out. When you want to “go bold” with your makeup it is best to simply apply it over your natural looking permanent makeup pigment. Will It Work for Any Skin Type? Microblading and permanent makeup will work on any skin type. 15% discount off second area of equal or lesser value done at the same time. Jamileh joined Renew MediSpa in 2011. 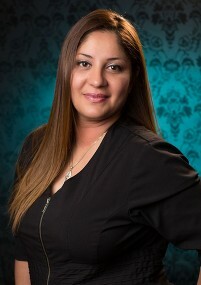 She received her teaching certificate and esthetician license in skin care and in permanent makeup in 2001. Since January of 2007 she has practiced permanent cosmetics, skin care and eyelash extensions. 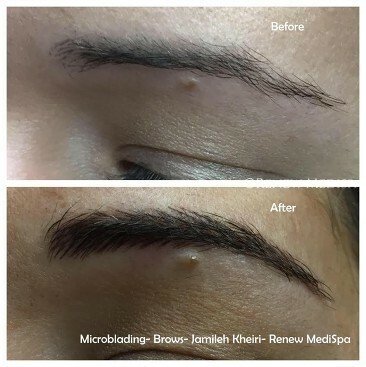 She is an expert in Micropigmentation, including the Microblading technique for brows. In 2017 she attended Master Classes in micropigmentation at the Nouveau Contour Institute in Orlando Florida, and another Master Class for areola pigmentation, to help women after breast cancer surgery. Jamileh’s emphasis on careful client consultation and her “two visit” approach to permanent cosmetics ensures that the client will achieve a natural and “just right, not overdone” look. Jamileh also performs salon facials, Lash Extensions, Viora Skin Tightening, Pellevé® Skin Tightening. She is one of our Certified Ultherapists at Renew, working closely with Dr. Vuich to design the best treatment protocol for each Ultherapy client. She has also been a professional threader (hair removal) since the age of 8. If you’re interested in learning more about Permanent Makeup, call us today to schedule your appointment. Dr. Lisa Vuich founded Renew Medispa to bring together both artistry and science to the practice of aesthetics. She has positioned Renew MediSpa as the regional industry leader in the field of non-surgical anti-aging and rejuvenation - skin treatments, platelet rich plasma therapies, laser treatments and other cosmetic procedures to keep you looking and feeling your absolute best at any age. All Rights Reserved. Reproduction and distribution of contents including images and artwork, in whole or in part, without prior written agreement is prohibited.